Hyundai will unveil its first full-size SUV for the american market, the Hyundai palisade at the 2018 LA Motor Show in a few weeks time. But a leaked image of the SUV has already appeared on the internet. The Palisade sits above the Santa Fe in the company's line-up and is its first three-row, eight seater offering in the SUV segment. It shares its underpinnings with the soon to be launched Kia Telluride but with unique styling. The Palisade gets the latest Hyundai design language with the two part headlamps and large cascading grille on the front fascia. There are beefed up wheel arches and prominent sculpting on the lower half of the body. This is a toned down version of the Grandmaster concept the company had shown earlier in the year. The Palisade will possibly be powered by a 3.3-liter V6 that produces 294 PS and 341 Nm, an engine found in various other Hyundai/Kia/Genesis cars. A smaller four-cylinder turbo might also be made available. Transission duties will be handled through an eight-speed auto while AWD should be an option. A hybrid version and a V8 version powered by the Genesis G90's 5.0-litre 420PS motor could also be made available.Expect all manner of family friendly equipment and safety features. The Stinger GT's 3.3-litre twin-turbo V6 with 365PS and 510Nm seems like an obvious choice. The Palisade fills a noticale gap in the company's line-up in the lucrative North american market. Large SUVs like this onne are very popular among buyers there as afamily runabout and every major car maker has a presence in this category. 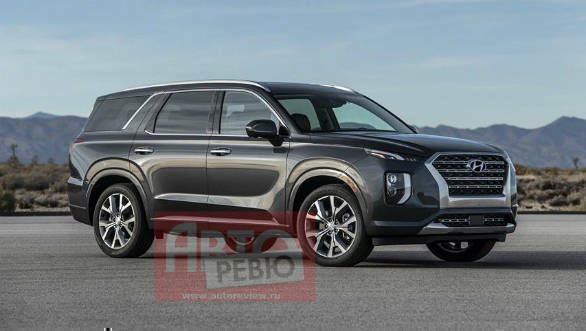 The Hyundai Palisade SUV will compete with the like of the Ford Explorer, Chevy Traverse and Honda Pilot, among amny others. The Palisade seems unlikely to be sold in India.